July – The Japanese government announces it is abandoning the original plans for a new National Olympic Stadium (Tokyo) for the 2020 Summer Olympics based on a design by Zaha Hadid. November 4–6 – The eighth annual World Architecture Festival is held in Singapore. 5 July – The Speicherstadt and Kontorhausviertel in Hamburg (including Chilehaus, an exceptional example of Brick Expressionism), are listed as a World Heritage Site. March – Comandante Ferraz Antarctic Station, designed by Estúdio 41, scheduled to commence operation. January 21 – Brooke Street Pier, Hobart, Tasmania. MPavilion (pop-up structure), Melbourne, designed by Amanda Levete‘s AL A.
September 6 – Shanghai Tower in Shanghai, the tallest building in China and the second-tallest in the world, is completed. January 14 – Philharmonie de Paris, designed by Jean Nouvel, opened. March 18 – European Central Bank HQ in Frankfurt. May 9 – Propsteikirche, Leipzig, designed by Schulz und Schulz, consecrated. October 23 – German Football Museum in Dortmund opened. May 4 – Parliament House, Valletta, designed by Renzo Piano. UTEC (Universidad de Ingeniería y Tecnología), Lima, designed by Grafton Architects with Shell Arquitectos. Federation Tower, in Moscow, the tallest building in Europe, projected for completion. March 10 – Learning Hub at Nanyang Technological University, designed by Thomas Heatherwick, opened. November 24 – National Gallery Singapore, designed by Studio Milou Architecture, projected for opening. January – Darbishire Place social housing for the Peabody Trust in London, designed by Niall McLaughlin Architects. February 14 – Extension to Whitworth Art Gallery in Manchester, England, designed by McInnes Usher McKnight Architects (MUMA). May 21 – HOME, an arts venue in Manchester, designed by Mecanoo. May 26 – Investcorp Building at Middle East Centre, St Antony’s College, Oxford, designed by Zaha Hadid. June – Trafalgar Place housing development in south London by dRMM Architects completed. August – City of Glasgow College, Riverside Campus, designed by Michael Laird Architects and Reiach and Hall Architects, opens to students. October 8 – Newport Street Gallery in south London, a conversion of 1913 theatrical workshops into a free public art gallery by Caruso St John architects. October – New building for the University of Oxford‘s Ruskin School of Art in Bullingdon Road by Spratley Studios. November 30 – Blavatnik School of Government in the University of Oxford, England, designed by Herzog & de Meuron, begins to function. Clergy Court (new cloister) at Blackburn Cathedral in the north of England, designed by Purcell, projected for completion. Outhouse, a house in the Forest of Dean, by Loyn & Co architects. A House for Essex, Wrabness, designed by Charles Holland of FAT with Grayson Perry. May 1 – New Whitney Museum of American Art in the Meatpacking District, Manhattan, designed by Renzo Piano. December 23 – 432 Park Avenue, the tallest residential building in the world is completed. January – Tokwe Mukorsi Dam, Masvingo. April 24 – August 2 – “Drawing Ambience: Alvin Boyarsky and the Architectural Association” at the RISD Museum in Providence, Rhode Island. May 1 until October 31 – Expo 2015 held in Milan, Italy. The year 2016 in architecture involved some significant events and new buildings. International Convention Centre Sydney opened. October – 1 William Street, the tallest building in Brisbane, designed by Woods Bagot, is completed. Dacheng Muslim Cultural Center, by He Jingtang opens. BND Headquarters (Federal Intelligence Service) in Berlin projected for completion in January. Dom-Römer Project for old town reconstruction in Frankfurt projected for completion. October 23 – Parochialkirche church tower reconstruction in Berlin is completed. BNL BNP Paribas headquarters, Rome, designed by 5+1AA (Alfonso Femia and Gianluca Peluffo), is completed. April 28 – The reconstructed Wignacourt Arch is inaugurated. May 12 – Warsaw Spire, the second tallest building in Warsaw and Poland is completed. October 5 – Museum of Art, Architecture and Technology (MAAT), Lisbon, designed by Amanda Levete of AL A.
December 22 – Lotte World Tower, the tallest building in Seoul and South Korea, is completed. September – Anantara Kalutara Resort, Kalutara projected for completion to a design by Geoffrey Bawa (d. 2003). August 29 – MahaNakhon opens in Bangkok. August 26 – Yavuz Sultan Selim Bridge the second tallest suspension bridge in the world opened. August 31 – Dubai Opera opened. April 27 – Hastings Pier reconstruction, designed by Alex de Rijke of dRMM Architects, opened (Stirling Prize winner 2017). May 21 – Command of the Oceans at Chatham Historic Dockyard, designed by Baynes and Mitchell Architects, opened. June 17 – Tate Modern Switch House (art gallery extension, subsequently named Blavatnik Building) on London Bankside, designed by Herzog & de Meuron, opened. Art and Design Building, Bedales School, Steep, Hampshire, designed by Feilden Clegg Bradley Studios. City Campus, City of Glasgow College, Scotland, designed by Reiach and Hall Architects and Michael Laird Architects. Ineos headquarters building at Grangemouth, Scotland, designed by Michael Laird Architects, completed. Barrett’s Grove (apartments), Stoke Newington, London, designed by Groupwork and Amin Taha. October – Photography studio for Juergen Teller, London, designed by 6a Architects. October 20 – Victoria Gate shopping arcade, Leeds, designed by Acme Space, opened. November 24 – Holland Green (apartment blocks) in the London Borough of Kensington, designed by Reinier de Graaf of Rem Koolhaas‘s Office for Metropolitan Architecture (OMA) and interior refurbishment of the adjacent 1962 Commonwealth Institute building by John Pawson as new premises for the Design Museum, opened. December 8 – Winton Gallery at Science Museum, London, designed by Zaha Hadid. House for Rowan Atkinson near Ipsden, Oxfordshire, designed by Richard Meier & Partners Architects with Berman Guedes Stretton and Roger Stretton. Incurvo (private house) near Goring-on-Thames, Oxfordshire, designed by Adrian James Architects. September 24 – National Museum of African American History and Culture in Washington, D.C., designed by David Adjaye opened. March 4 – World Trade Center Transportation Hub in New York City opened. March 18 – July 31: “A Japanese Constellation: Toyo Ito, SANAA, and Beyond at MOMA in New York City“. May 28 – November 16: “TIME-SPACE-EXISTENCE” at the Palazzo Bembo, Palazzo Mora and Palwzzo Rossini in Venice, Italy. The year 2014 in architecture is expected to involve some significant events. Infinity Tower, the tallest building in Brisbane, is completed. 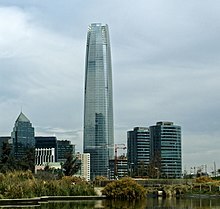 Gran Torre Santiago, the tallest building in South America and Latin America, projected for completion. Taunusturm in Frankfurt is completed. Ocotber 2 – Biomuseo in Panama City, designed by Frank Gehry, opens. July 21 – Philippine Arena, the world’s largest indoor domed-arena, in Ciudad de Victoria, Bocaue and Santa Maria, Bulacan, is completed. * December 3 – May 3, 2015 – “One Way: Peter Marino” at the Bass Museum in Miami Beach, Florida. The year 2013 in architecture involved some significant architectural events and new buildings. March 1 – The first phase of the Old Port of Marseille renewal is inaugurated. March 28 – Paradise Center, in Sofia, the largest shopping mall in Bulgaria. April 13 – The Rijksmuseum in Amsterdam reopens its doors after a 10-year restoration and renovation project. April – The 11th-century minaret of the Great Mosque of Aleppo in Aleppo, Syria, is destroyed during civil war fighting. 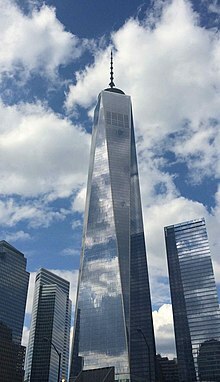 May 10 – One World Trade Center becomes the tallest building in the United States and the third-tallest building in the world by pinnacle height (not yet complete). June 12 – The Berlin City Palace foundation stone laying ceremony is held in Berlin. The building is expected to be completed in 2019. July 11 – Work begins on a Lego model of Durham Cathedral in England, the beginning of a huge fund-raising effort. August 3 – The Shanghai Tower, topping out ceremony is held in Shanghai. The tallest building in China and the second-tallest in the world is expected to be completed in 2014. October – The sixth World Architecture Festival is held in Singapore. November 12 – The Height Committee of the Chicago-based Council on Tall Buildings and Urban Habitat (CTBUH) makes the controversial announcement that One World Trade Center is the tallest building in the United States at 1,776 feet, declaring that the mast on top of the building is a spire since it is a permanent part of the building’s architecture. March – New building for the National Aquarium Denmark, designed by 3XN, in Copenhagen. June 1 – Museum of European and Mediterranean Civilisations national museum in Marseille, in the South of France, designed by Rudy Ricciotti. May – Extension to Lenbachhaus art museum, designed by Foster and Partners, in Munich, Germany. November 19 – Museo Júmex, Mexico City, designed by David Chipperfield. August 2 – Cardboard Cathedral in Christchurch, New Zealand, designed by Shigeru Ban with Warren and Mahoney. April 19 – Museum of the History of Polish Jews, designed by Rainer Mahlamäki, in Warsaw, Poland. October 29 – The Marmaray rail tunnel under the Bosphorus strait, the world’s deepest undersea immersed tube tunnel, Istanbul, Turkey. February 1 – Bishop Edward King Chapel at Ripon College Cuddesdon in Oxfordshire, England, designed by Niall McLaughlin Architects, is dedicated. March – Number One Riverside civic offices in Rochdale, designed by FaulknerBrowns Architects, opens to the public. April – The Shed temporary auditorium for the National Theatre on the South Bank in London, by Haworth Tompkins. May 30 – Mary Rose Museum, designed by Wilkinson Eyre Architects and Pringle Brandon Perkins+Will, at Portsmouth Historic Dockyard in England. June 28 Scale Lane Bridge over River Hull in the UK, designed by McDowell+Benedetti with engineers Alan Baxter Associates and Qualter Hall. September 3 – Library of Birmingham, the largest public library in the United Kingdom, designed by Mecanoo. September 30 – SSE Hydro arena in Glasgow, Scotland, designed by Foster and Partners. January: James B. Hunt Jr. Library the main library of Centennial Campus of North Carolina State University, designed by Snøhetta, in Raleigh, North Carolina, United States. April 25 – The George W. Bush Presidential Center in Dallas, Texas. November 27 – Kimbell Art Museum expansion, named the Renzo Piano Pavilion, designed by Renzo Piano, in Fort Worth, Texas, is officially inaugurated. December 4 – Pérez Art Museum Miami, designed by Herzog & de Meuron, in Miami, USA. Mercury City Tower, in Moscow, the tallest building in Europe, is completed. June 10 – Cayan Tower in Dubai Marina, the world’s tallest tower featuring a 90-degree twist, is completed. December 18 – Stonehenge Visitor Centre, Wiltshire, England, designed by Denton Corker Marshall. Tate Britain renovation in London, by Caruso St John. November 13 – Four World Trade Center, New York City. Pritzker Architecture Prize – Toyo Ito. The year 2012 in architecture involved some significant events. January 1 – Ada Bridge, one of the tallest bridges in Europe, is completed and open to the public in Belgrade, Serbia. January – Isabella Stewart Gardner Museum extension in Boston, Massachusetts, designed by Renzo Piano Building Workshop is opened. January – JW Marriott Marquis Dubai Hotel the tallest hotel in the world is opened is Dubai. February – Extension to Städel art gallery in Frankfurt, Germany, designed by schneider+schumacher, scheduled for opening. February 28 – Halley VI Research Station, designed by Faber Maunsell and Hugh Broughton Architects, becomes operational in the Antarctic. 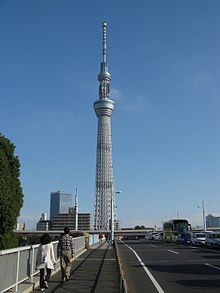 February 29 – Tokyo Skytree, the tallest tower in the world, is completed inSumida, Tokyo, Japan. March – Jerwood Gallery on The Stade in Hastings, England, designed by Hana Loftus and Tom Grieve of HAT Projects, opens. March 19 – Western concourse, London King’s Cross railway station, designed by John McAslan + Partners, is officially opened. March 24 – Maria Skłodowska-Curie Bridge, Warsaw, the eighth road bridge in the capital of Poland, is opened. March 29 – Refurbished Museum of Contemporary Art Australia, Sydney with new Mordant Wing, designed by Sam Marshall, opened. March 31 – Sandworm by Marco Casagrande is officially opened in the Beaufort04 Triennial of Contemporary art in Wenduine, Belgium. The work is both architecture and environmental art. April 4 – Twin Sails Bridge, Poole, England, by Wilkinson Eyre Architects, opened to traffic. April 10 – SeaCity Museum, Southampton, England, with extension by Wilkinson Eyre Architects, opened. June – Airport Link, a 6.7 km road tunnel in Brisbane, the longest in Australia, is completed. May 11 – ArcelorMittal Orbit observation tower and sculpture in Olympic Park, London, designed by Anish Kapoor withCecil Balmond and Ushida Findlay Architects, unveiled. June 29 – Cloud Forest and Flower Dome Bay South Conservatories at Gardens by the Bay, Singapore, designed byWilkinson Eyre Architects (landscape design by Grant Associates), opened. July 3 – Giant’s Causeway Visitors’ Centre in Northern Ireland designed by Heneghan Peng for the National Trust is opened. July 5 – Shard London Bridge, designed by Renzo Piano, is officially opened and becomes the tallest building in the European Union (2012–present). July 18 – Tate Modern, London, opens The Tanks performance art/installation space, refurbished by Herzog & de Meuron. London Velopark, designed by Hopkins Architects, Expedition Engineering, BDSP, and Grant Associates. August 3 – Queen Elizabeth II Courts of Law, Brisbane, Australia is officially opened. September 21 – Islamic art gallery at the Musée du Louvre in Paris, designed by Mario Bellini and Rudy Ricciotti, opened. September 23 – Renovation and new wing for Stedelijk Museum Amsterdam, designed by Benthem Crouwel Architekten, opened to public. November 1: Mercury City Tower, in Moscow, topped-out to become the tallest building in Europe (2012–present). December 11 – Le Louvre-Lens art gallery in Lens, Pas-de-Calais, France, designed by SANAA, is opened. Baluarte Bridge, the longest cable-stayed bridge in Latin America, projected for completion. ME Hotel, London, designed by Foster and Partners, is opened. Princess Tower, the world’s tallest residential building, is completed in Dubai. Soleil, the tallest building in Brisbane, Australia designed by DBI Design, is completed. Astley Castle in North Warwickshire, England, is refurbished for the Landmark Trust by Witherford Watson Mann Architects (winner, Stirling Prize, 2013). University of Limerick Medical School in Ireland designed by Grafton Architects. Sarajevo City Center projected for completion. Astrup Fearnley Museum of Modern Art new buildings are opened in Oslo, Norway. October – The fifth World Architecture Festival is held in Singapore. 1 November: Mercury City Tower in Moscow becomes the tallest building in Europe. 30 April: 1 WTC surpasses the height of the Empire State Building to become the tallest building in New York City. October: Second hurricane survival of 1 WTC. October 17: Franklin D. Roosevelt Four Freedoms Park in New York City, designed by Louis Kahn, is opened with a dedication ceremony. 11 December: 1 WTC’s spire comes to New York City.